The Performance Monitor™ provides the ability to track the performance of your vehicle over short periods of time, distance and acceleration. 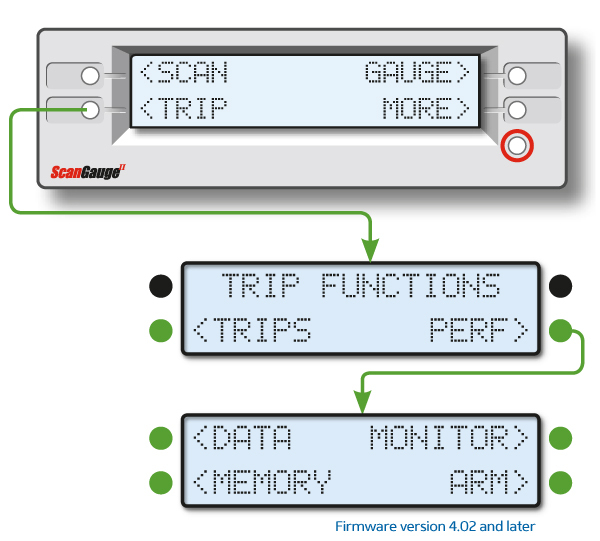 You can think of the Performance Monitor as a performance-based Trip computer with a specialized purpose. Performance Monitor also allows you to save and recall up to 8 performance runs. You can step through the data by time, speed or distance for a snapshot of your vehicles performance. Monitored Gauge Use the Monitor Function to select a built-in digital gauge to monitor. Data will be recorded for the selected gauge. The data the Performance Monitor records can be read through the DATA screen. The data screen displays the speed, distance and elapsed time for each data point. A data point is generated each time the Performance Monitor records data. While viewing the Data screen, you can use the upper left and right function buttons to step through the data points. While vieing the DATA screen, the lower right function button toggles the step-through mode, allowing you to step through the data points using the different criteria. The currently selected step-through mode is shown next to the lower right function button. The information layout on the DATA screen maintains a consistent layout as you switch between data step-thru modes. For instance, Distance (ft) is shown in the upper left of the screen, while speed (MPH/KPH) is shown in the upper right of the screen, and elapsed time (Sec) is shown near the bottom middle portion of the screen. See the chart Step-Through Parameters and Recording Rates on the following page for more information about each Data parameter and step-through intervals. The Performance Monitor can provide a wealth of information about your vehicle’s performance. Here are a few quick tips on how to use the data after a Performance Run to help get the most out the Performance Monitor. On the Data Screen, set the step-through parameter to Distance (D) and step through the data until distance shows 1320ft. 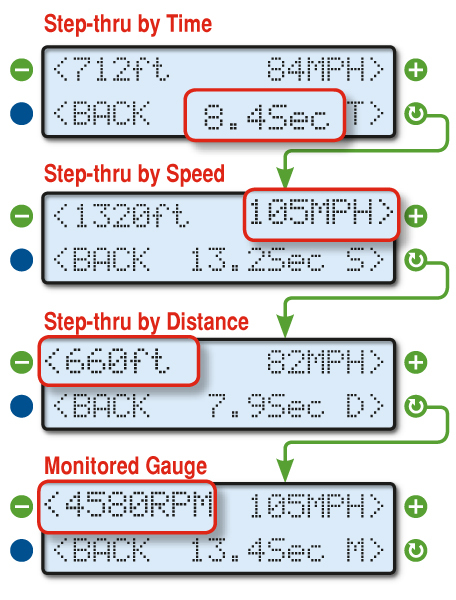 On the Data Screen, set the step-through parameter to Speed (S) and step thru through data until speed (MPH) shows 60MPH. The time displayed on the bottom line is your 0-60 time. On a closed course, start by bringing your vehicle up to speed­­­, just below 60 MPH, and hold your speed while your passenger arms the Performance Monitor. Then, bring your vehicle’s speed up to 60 MPH and then begin braking. 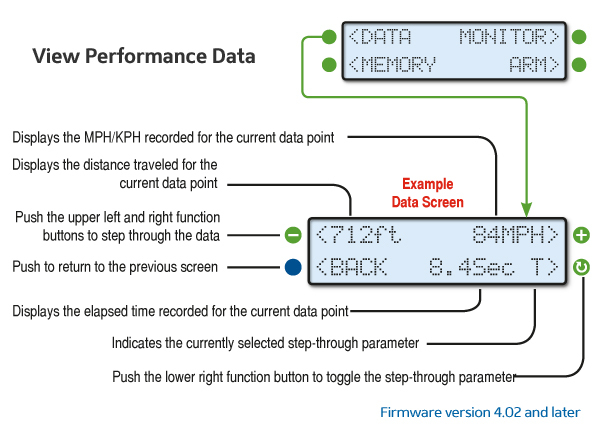 Once your speed reaches 0, the Performance Monitor will automatically stop recording data. Finally, set the step-through parameter to Speed (S) and step through the data until speed shows 0 MPH. Read the distance (ft) parameter for breaking distance and the time (Sec) parameter for breaking time.